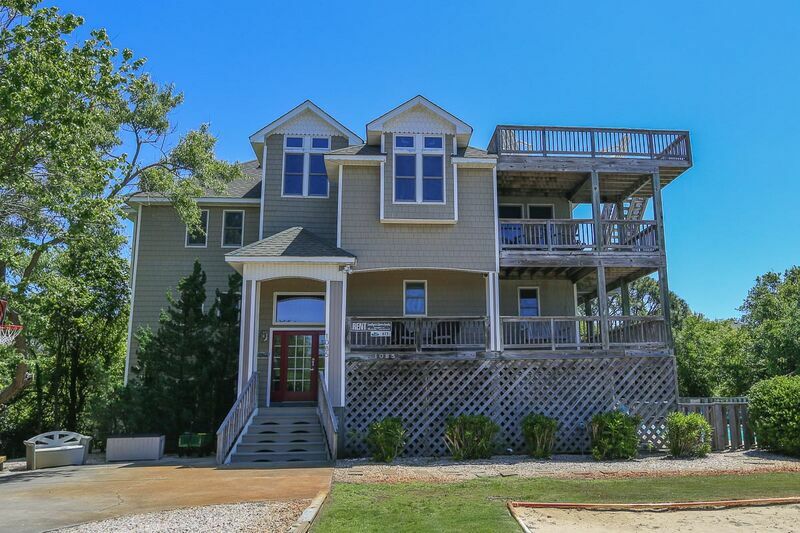 Relax in this beautifully designed home only three rows back from the pristine beaches of Corolla. Gaze at the breathtaking views of the ocean, sound and Currituck Lighthouse. 3 bedrooms (1 master bedroom with King, 1 with Queen, 1 with 2 Bunk sets), 2 full baths. Game room with pool table and game table, TV/DVD player, stereo, wet bar with full size refrigerator and access to pool area. 3 bedrooms (master bedroom with King, 2 with Queen), 2 full baths. Sitting area with 1 Queen sleep sofa; deck access, spacious laundry facility. Huge great room with wonderful ocean views, large flat screen TV/DVD player, stereo with CD player. Gourmet kitchen, well-equipped for your large group, powder room. Ship’s watch with views of Currituck Lighthouse and the sound. Access to rooftop deck with panoramic ocean, sound and lighthouse views. Master bedroom with King, whirlpool tub and deck access. WE SPENT OUR 50TH WEDDING ANNIVERSARY WITH OUR CHILDREN AND GRANDCHILDREN. THIS HOME IS FANTASTIC. EVERYTHING YOU NEED IS PROVIDED. AGE RANGE WAS 71 - 6 AND EVERYONE HAD A WONDERFUL TIME. EVERYTHING WAS IN GREAT SHAPE. I HAD A CONCERN ABOUT THE POOL AND HOT TUBE MAINTENANCE BUT THAT WAS ALSO PROVIDED BY OWNERS. WE HAD A PROBLEM WITH A LEAK BUT AS SOON AS IT WAS REPORTED IT WAS TAKEN CARE OF.--THE LEAK WAS ONLY CONDENSATION FROM THE AIR VENTS. ALL LINENS WERE PROVIDED WHICH WAS GREAT NOT HAULING THOSE THINGS. THANK YOU TO THE OWNERS FOR THE SURPRISE ON THE FIRST DAY..